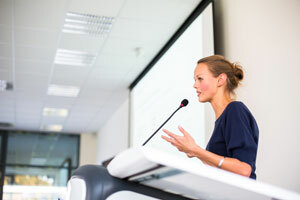 Public speaking can be a nerve-wracking experience for anyone. If you become successful in the media industry, you’re bound to have to stand up in front of a crowd at some point in your career. 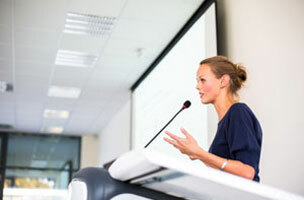 Fortunately, we have some tips to help make your first speaking gig less excruciating and, dare we say… maybe even fun. If anything about your talk bores you, cut it or change it. Just like in your writing, you can’t expect someone to be interested in what you’re saying if you’re not. Finally, the best pointer, and one that you probably remember from Public Speaking 101, is to never write out your speech word for word. Limit yourself to a couple of note cards with bullet points for reference. Usually, if you’ve been invited to speak somewhere, you know your material, so trust yourself. To hear more, including what to do when that one curmudgeon in the audience tries to challenge you, read: 5 Tips on Nailing Your First Speaking Gig.